Generations have grown up knowing that the equation E=mc2 changed the shape of our world, but never understanding what it actually means, why it was so significant, and how it informs our daily lives today--governing, as it does, everything from the atomic bomb to a television's cathode ray tube to the carbon dating of prehistoric paintings. 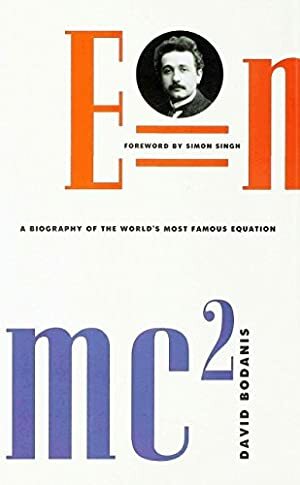 In this book, David Bodanis writes the "biography" of one of the greatest scientific discoveries in history--that the realms of energy and matter are inescapably linked--and, through his skill as a writer and teacher, he turns a seemingly impenetrable theory into a dramatic human achievement and an uncommonly good story. Track It. This book has been $5.93 within the past year. Log In to track David Bodanis on eReaderIQ. to be notified each time the price drops on any book by David Bodanis. to stop tracking David Bodanis. Log In to track Simon Singh on eReaderIQ. to be notified each time the price drops on any book by Simon Singh. to stop tracking Simon Singh. The price of this book has changed 150 times in the past 2,740 days. The current price of this book is $9.58 last checked 6 hours ago. This lowest price this book has been offered at in the past year is $5.93. The lowest price to date was $3.03 last reached on November 18, 2011. This book has been $3.03 one time since we started tracking it. The highest price to date was $11.99 last reached on July 29, 2018. This book has been $11.99 5 times since we started tracking it. We last verified the price of this book about 6 hours ago. At that time, the price was $9.58. This price is subject to change. The price displayed on the Amazon.com website at the time of purchase is the price you will pay for this book. Please confirm the price before making any purchases.